The first week of July 2018 saw a spike in the killings of Human Rights Defenders (HRDs) in Colombia, as 9 HRDs and Social leaders were killed over four days. In light of this recent wave of murders, the UN has raised concerns about the nature of HRD killings in Colombia. Alberto Brunori, the Representative of the UN Office of the High Commissioner for Human Rights (UN OHCHR) in Colombia, stated that the situation for HRDs is very serious, noting that his office is currently dealing with at least 90 cases of HRDs who have been killed. New figures have also been released by the Defensoria, highlighting that since the beginning of 2016, 330 HRDs and Social Leaders have been killed. On 10 July, President Santos sanctioned new measures in response to the violence against HRDs, but more reform is needed to address the high levels of impunity surrounding HRD assassinations. The recent killings of HRDs in Colombia highlight once again the concerning levels of targeted violence against social leaders throughout Colombia, as well as the lack of security and operational spaces for HRDs. Violence against HRDs has been increasing since the Peace Accord between the Colombian Government and the FARC guerrilla was signed in 2016; with, on average, one HRD killed every 3 days. This increase according to the UN, is one consequence of the power vacuum created when the FARC demobilised and left the rural areas that they had previously controlled. Social leaders and HRDs working on issues related to the implementation of the peace accord, land restitution and those opposing large-scale economic development projects face a particularly high risk. In response to the recent wave of violence against HRDs, large parts of Colombian civil society have come together to protest and demand more security for those protecting human rights. 13 July 2018, saw gatherings in almost 50 cities in Colombia and around the world, calling for an end to violence against HRDs and Social Leaders, using the hashtags #QuiénLosEstáMatando (‘who is killing them’), #NosEstanMatando (‘they are killing us’). As well as public manifestations of support for HRDs, several civil society organisations, including Somos Defensores and ABColombia partners the Lawyers Collective Jose Alvear Restrepo (CCAJAR) and the Inter-Church Commission for Justice and Peace (CIJP), joined together to produce a report highlighting the systematic nature of HRD violence in Colombia called Defender la Vida (“Defending Life”). This report was presented to the Prosecutor’s Office at the International Criminal Court in April 2018, and to the Colombian Truth Commission on 5 July 2018, and called for an end to the impunity of those responsible for violence against HRDs. In March 2018, the Inter-American Commission for Human Rights (Commission) expressed concern that many of the murdered defenders were working on implementing the Peace Accord. This was re-interated by the Office of the United Nations High Commissioner for Human Rights in Colombia when it warned of the damage that this situation is causing to the peace process and to Colombian democracy. In July 2018, the Commission pointed out that these murders were happening in a broader context of violence faced by HRDs in Colombia and that such attacks also harm the people for whom defenders work, leaving them more vulnerable and with no one to defend them. 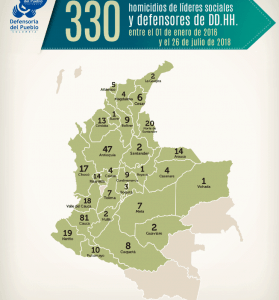 Defensoria del Pueblo figures: 330 Social Leaders were killed in Colombia between 1 January 2016 and 26 July 2018. The Defensoría del Pueblo (Colombian Ombudsman) have stated that between 1 January 2016 and 26 July 2018, 330 HRDs have been killed, whilst the Fiscalía (National Prosecutor’s Office) have claimed the number is much lower at 178 HRDs. Civil Society organisation, Somos Defensores, have reported that between 2002-2017 610 HRDs have been killed, highlighting the ongoing nature of the issue. INDEPAZ and Organisation Cumbre Agraria also released figures of HRD murders, stating that in June 2018 alone, 17 HRDs had been killed. While the figures provided by different bodies and organisations diverge due to various factors, such as the definition of “HRD”/ “Social Leader”, they all coincide in documenting a concerning incremental increase in the number of violent deaths of social leaders since 2016. The UN Secretary-General Antonio Guterres in a report to the Security Council (July 2018) expressed grave concern at the spike in killings of HRDs following last month’s election won by President-elect Ivan Duque. The recent wave of killings of HRDs has brought with it calls for more security and reforms from the UN and civil society. Alberto Brunori, Representative of the UN OHCHR in Colombia, highlighted the need to investigate the structures behind killings of HRDs in Colombia, as well as to find a solution to the high levels of impunity in such cases. The question then is how the Colombian government can secure the security and operational spaces for HRDs as well as decrease the impunity of such cases. Decreasing impunity is proving difficult, especially considering that the Fiscalía (Prosecutor’s Office) and the Minister of the Interior, Guillermo Rivera, are continuing to shift the blame of HRDs murders on to narcotrafficking. This claim diminishes the issue of HRDs security in Colombia and ignores the systematisation of HRDs killings in the country. Whilst newly elected president Iván Duque has condemned the massacre of 7 people in Cauca, he was slow to criticise the recent HRD murders. In response, civil society organisations are claiming too little is being done by the Colombian government, as only 50% of 170 of the cases of HRD murders are being investigated. Nonetheless, civil society mobilisation has not been in vain. On 9 July, President Juan Manuel Santos sanctioned a new law increasing the punishment for threats and extorsion against HRDs and their family members, meaning that anyone committing these crimes can face up to 4-8 years in prison. In a meeting on 10 July, Santos also implemented 8 new measures in an effort to curb killings of social leaders, in addition to previous army reorganisation and early warning system put in place to address the issue. 1) Acceleration and expansion of collective security measures in Corinto, Caceres, El Bagre, Buenaventura, Quibdó and Tame. 2) An urgent intervention plan has been put in place, led by Defense Minister Luis Carlos Villegas, for security in the most affected zones: Cauca, Antioquia, Norte de Santander, Valle del Cauca, Risaralda, Nariño, Córdoba and Chocó. 3) Within the “Plan Horus”, the component of security of social leaders and HRDs will be prioritised and complemented by specific control actions with a focus on priority areas. 4) In order to strengthen the collective protection, the Ministry of Defence in cooperation with the Protection Sections of the Police, will implement “Basic Protection Units”. 5) Strengthening of the National Protection Unit. This body has in large part managed the protection of social leaders, but much more needs to be done. More funds will be allocated for collective risk studies and protection schemes for individuals. 6) The Defense Ministry to make more effort to respond to alerts sent by civilian authorities: The Ministry of Defence will strengthen the fast response mechanism that takes care of alerts from the Defensoria (Ombudsman) within the Prevention and Alerts System created by the Peace Accord. 7) The Ministry of the Interior will set up a single reporting phone line for receiving information about threats against social leaders and HRDs. 8) A system of rewards for any information that helps identifying the responsible actors behind attacks against HRDs and social leaders. These rewards will be even higher for identifying the intellectual authors of these crimes. Interior Minister Guillermo Rivera has also stated that the government is trying to implement a collective protection model for HRDs through the Decree 660 of 2018. Whilst all of these measures are to be supported, the problem in Colombia remains the same – a lack of full and effective implementation. The constant introduction of new measures whilst failing to fully implement exisisting measures offers no deterent to the perpetrators of these crimes. HRDs play a vital role in the implementation of the peace accord. Their work is crucial to strengthening the rule of law and defending land rights, the environment and their communities. Securing the prize would challenge the growing discourse that dismisses and delegitimises non-violent activists as terrorists, anti-patriots, or threats to security and development. Ultimately, it would help to change the narrative regarding Human Rights Defenders, recognising them not as trouble-makers, but as peace-builders. Support and promote the work of the Colombian Special Investigation Unit to ensure fully investigation of both the perpetrators, and the authors of the crimes against HRDs and bring them swiftly to justice. Guarantee full access to public services and cultural, social and economic rights for communities in Chocó, including the right to education and health. Ensure that the Unidad Nacional de Proteccion (National Protection Unit) swiftly responds to requests for effective protection measures from Human Rights Defenders and their families and provides effective protection measures for family members of human rights defenders who have been killed.